You have goals. One of the biggest goals might be to lose weight for the benefit of your health and self-confidence. You’re trying to eat healthier and might have seen results from the lifestyle change. But you know exercise is an important part of the equation. Trouble is, chronic pain keeps you from starting a fitness program. The pain makes it hard enough to do the things you need to do day-to-day. Adding exercise into the mix seems almost impossible, even if you know it will positively affect your weight-loss goals. There might be something you haven’t tried, though, that can not only get you moving but decrease your pain. Aquatic therapy in a swim spa from Master Spas. But it’s not just about logging exercise. The ability to change the water temperature to a therapeutic 94 degrees, or up to 104 degrees if you’re not exercising, also helps. So what is chronic pain? The Centers for Disease Control says it is pain on most days or every day in the past six months. CDC statistics show that more than 20% of American adults live with chronic pain but it could be as high as 40%. And for some, about 8% of adults, struggle with high-impact chronic pain. Pain that limits their ability to perform the activities of daily life. For some, the pain might be injury related or because of arthritis. Others might suffer from a chronic condition like fibromyalgia or rheumatoid arthritis. Aging, weight and poor posture can also be responsible. Still, for some there might not be an obvious cause. The cost of chronic pain is more than a decreased quality of life. Medical costs, lost productivity and disability programs add up to an estimated $560 billion a year. Traditional therapies often include medicine, whether over-the-counter or prescription. But more people are seeking alternative treatments — like exercise, massage and hot water therapy — to manage the pain. Where can someone find all three of those? In a swim spa from Master Spas. Swim spas from Master Spas feature a therapy cove, where jets help ease muscle aches and loosen up stiff joints. Every day is different when you are living with chronic pain. You might be ready to take on the week on Monday. But by Wednesday? You are using a cane to get from the bedroom to the kitchen. The thought of making breakfast and getting to work on time seems overwhelming. Exercise? You feel anxious just thinking about it. But research shows that while people with chronic pain might fear the pain of exercise, it can do a lot of good. Exercise can help with oxygen and blood delivery, which can help muscles from tightening up. Exercise changes how the brain reacts to pain and normalizes the process of pain signals. Exercise promotes the release of chemicals that turn off pain. And aquatic exercise might have even more benefits. Not only will people with chronic pain enjoy the benefits of the natural buoyancy of water to get in a low-impact workout, they will feel better mentally. Several studies shown that water exercise for chronic pain triggers an emotional response, improving mood and the likelihood of sticking to a program. In one group, those exercising in a pool reported saw improvement in pain, anxiety and depression. The number of days feeling good increased. The program might start with five or 10 minutes of movement (walk, swim, row) and gradually working up. With a swim spa, you just have to walk outside. There’s no extra effort to get to a fitness class or gym, which might increase pain. Or, the commute might not seem like too much hassle. Plus, once you are finished exercising, you get to head over to the therapy seating for a custom massage. You don’t get that at the gym. Remember: Always consult your doctor before beginning an exercise program. Stress reduction and relaxation are vital to controlling chronic pain. With a swim spa from Master Spas, the warmth of the water makes it easier to relax. You can exercise in in a therapeutic 92 degrees or soak with the temperature turned up to 104 degrees. It will help improve circulation, increase range of motion and improve flexibility. And your tense muscles associated with chronic pain will feel relief. Regular soaks can also cause a long-term decrease in inflammation, which is a root of pain for some chronic conditions. 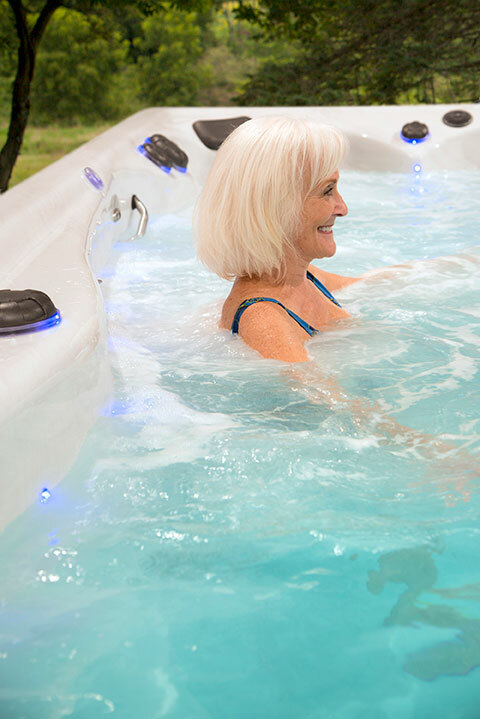 People with rheumatoid arthritis and fibromyalgia might see marked relief from using a swim spa for hydrotherapy. And the combination of soaking in water with regular exercise has been shown to be more effective than exercise alone. Studies looking at chronic neck pain and chronic low back pain found that the together, the two can reduce pain and disability, as well as improve quality of life. Learn more about the benefits of hot water therapy. Swim spas from Master Spas also feature adjustable therapy jets that target tense or tired muscles. The massage can help reduce pain, relieve stress and anxiety and, according to Harvard Health, “close the pain gate.” Massage, they say, stimulates nerve fibers and stops pain messages to and from the brain. Discover the benefits of owning a swim spa from Master Spas. Find your local dealer.